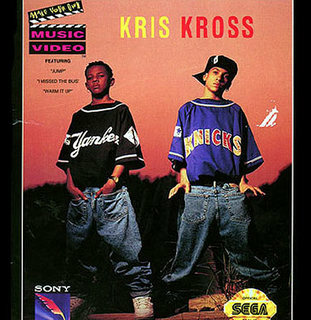 Who doesn’t remember those two cute little tweens, Chris Kelly and Chris Smith, or “Mac Daddy” and “Daddy Mac” of the rap duo Kriss Kross? They were all the rage when their hit Jump came out in 1992. These young Atlanta, Georgia natives also introduced to the world their own trademark style of wearing their jeans and shirts backwards. It’s said that Chris Kelly never stopped wearing his pants backwards, it was just a way of life for him up until his untimely death this week at age 34. Strangely, I had included a line about Kriss Kross in my April 19, 2013 Facebook Poem of the Day (poems I create using others’ Status Update posts). Here’s the poem. life is a donut. take a bite. I want the gold one! And, now, in honor of Chris Kelly and Kriss Kross, put your pants on backwards and…JUMP! Nice, eciN – thank you Wendy, thank you Chris Kelly(Mac Daddy), RIP.